You skip all you like that website is looking fantastic! today I was wearing wide leg trousers while having my hair cut. Good haircut = happy bunny. Glad you are skipping - I take it you aren't wearing those wedges then? Love the hair...yes, I do! oh my, love the new 'do'. i'm also a wide leg trouser fan, never went in for skinny jeans in the 80's and most certainly don't have the 'after children' figure for them now. yes yes yes tif, i'm sure the crafting is helping...it's what you do. and a lady can only keep her doilies in a cardboard box for so long. i love your new hair and your trousers. what a difference a day makes! Love the haircut! Can we see what it looks like from the front? I have always wanted hair like yours that would lay the way yours does in its new state. So cool and it'll always look good no matter if you brush it or not! 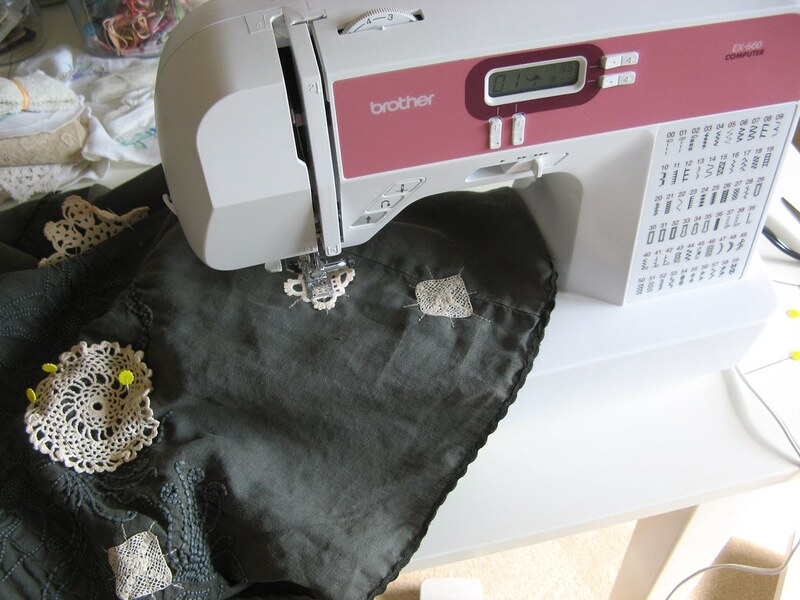 I'm also fascinated by what your machine is doing with the doily. New website looks great too. It must be something in the air because I too suddenly have a skip in my step. 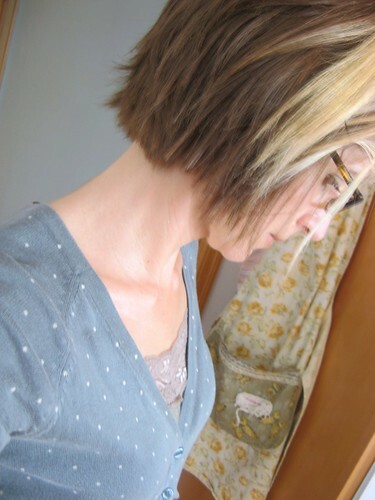 Or maybe it is the haircut because I had a lot chopped off mine last week too. Your new cut looks great by the way. Anyway, whatever it is, glad you've got that spring back. well done with getting down to the website - I am meant to be sorting out all my paypal buttons that didn't work last week and here I am looking at blogs and before I know it the children will be up and about and I'll be typing the wrong prices into the forms and getting muddled up again. Your new haircut looks gorgeous and the colour is brilliant! I would love to get mine cut the same way but it is not quite straight enough at the back and would kink out in an unfashionable manner. As for wide leg trousers- there should be no other kind! What a cute haircut that is, and I LOVE those trousers! 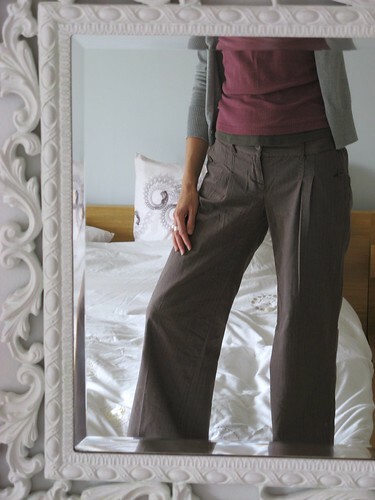 love wide legged trousers (with my hips I kinda have to!) and think your hair looks lovely too. I recently cut my hair too. Love it on you and your streakiness. I am glad things are looking sunny again. Love what you've done to your skirt,and your hair looks fab too!